•Easy and safe application – at free hand or with stencils. •Dries up quickly on the skin. •A two-tipped pen - one thin and one thick tip for better designs! To beautify ones body with henna tattoos on festive occasions is a tradition that is present in many cultures. In the last decade, tattoos and body decorations have also become a popular trend among young people all over the world. •Enhances make-up and can replace jewellery. •Stays on the skin for a few days. •Refresh the tattoo and make it darker by reapplying. Application: Apply Henna Penna directly on the skin, at free hand or with inspiration from stencils. Reapply to refresh the tattoo or for a darker shade. Henna Penna Original colour stays on the skin for a few days. 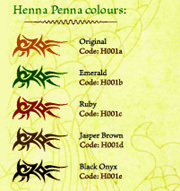 Designs made with the other Henna Penna colours have a shorter lifespan due to a lower concentration of Henna extract. Close cap after use to keep contents from drying out. Tip: The application of lemon juice on the design can some­times make the colour more intense. Many people have hesitated to do permanent tattoos and decorations with cosmetic products. Thanks to Henna Penna you can now get beautiful temporary tattoos with natural henna extract without the complicated and time consuming process that traditional henna tattoos require. •100 percent natural ingredients. •No preservatives, synthetic colorants, PPD or perfumes. •Not tested on animals. Henna Penna’s technology is multifunctional. It is also being used for marking the skin before surgical interventions at hospitals worldwide. Its qualities make it an excellent tool both for the beauty case and the surgeon’s operation kit.